Peax ... reliable and efficient machines. Peax plans to increase its market share in the rental sector by introducing the latest technology and backing it up with excellent customer service. The future for the plant hire business is bright, according to the managing director of Peax, a branch of Saudi Diesel Equipment Company (SDEC) and a leading Saudi-based power and equipment rental provider. Mohsen Al Najjar adds that with contractors unwilling to investing in new equipment and instead looking at renting, demand for rental construction fleet is increasing. Renting equipment rather than buying provides contractors with an opportunity to reduce their capital investment, he points out. Peax continues to build on its successful business model while enhancing its capabilities as a leading power and equipment rental provider in the region. Its rental fleet includes small and large generators, lighting towers, air compressors, material handling equipment, transformers, fuel tanks and load banks. Peax has more than 1,500 units in its fleet. The company has recently implemented a state-of-the-art remote monitoring system, which allows its operations and service managers to monitor sites and machine conditions from a distance and predict any irregularities before these create a real problem at the customer’s site. 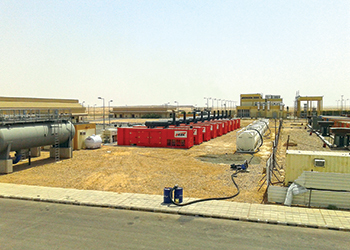 “This ensures smooth operations, quick and efficient action whenever there is a potential for any breakdown, to minimise downtime and provide for sustainable and reliable site operation,” says Al Najjar. Peax aims to be an efficient and reliable source for the most innovative rental solutions, offered at the most reasonable rates in today’s market. The equipment rental company has around 1,500 fleet units, with its biggest product category being power generators. All equipment is offered under the Peax brand, as the company sets the requirements for its fleet. Peax offers wide support to back its rental offer. According to Al Najjar, this includes engineering support in terms of sizing and selecting the right machine for the right application; and supervising installation and commissioning, and start-ups. Support operations are carried out via its workshops, mobile service vehicles, and field service technicians. For large projects or mega projects, it provides onsite operators. 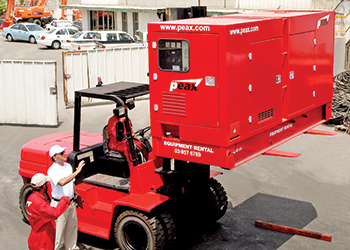 Peax is a quality-focused power and equipment rental provider in the region with a proven track record of satisfying the rental needs of its broad base of clients, including prestigious governmental organisations, oil and gas, contracting and industrial firms, and commercial and residential complexes. It is working with the major large clients in the country including Saudi Aramco, Saudi Basic Industries Corporation (Sabic), Maaden, and Samsung, among others. Peax operates from its main locations in Al Khobar, Riyadh, Jeddah, Jubail and Madinah in Saudi Arabia; and offers 24/7 kingdom-wide service and maintenance support. It is also in the process of activating its branches in the UAE and Egypt.